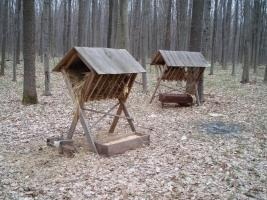 Forests in Ukraine are distributed unevenly. They are mostly found in Ukrainian Carpathians and also in Polesie region. 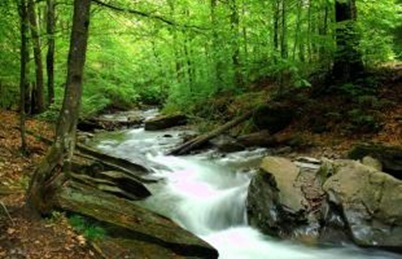 The Transcarpatian region with mountain fir (Abies) stands is known as the most wooded region in Ukraine. Flora of Ukrainian forests is very rich due to diversity of climate zones. The total number of plants is approximately estimated. Ukrainian forests include more than 30 tree species such as: pine (Pinus sylvestris) as a dominant species, from which, until recently, pine sap - turpentine was extracted, oak (Quercus robur), beech (Fagus silvatica), spruce (Picea abies), birch (Betula pendula), alder (Alnus glutinosa), ash (Fraxinus excelsior), hornbeam (Carpinus betulus), fir (Abies alba). Coniferous forest stands cover 42 % - mainly pine (33%). Deciduous forests cover - 43 %, -mainly oak and beech (32%). 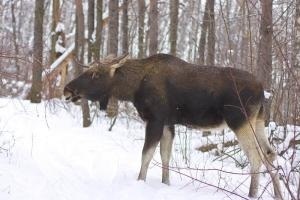 Fauna in Ukraine is historically part of the ecosystems (biocenosis). The most common hunting ungulates in forests are the following: European roe deer (143 600), wild boar (58 600), moose (5 600), red deer (16 000), spotted deer (Axis axis) (4 300), fallow deer (3 400) and mouflon (500). Hunting fur animals are the following: hare, fox, muskrat, marten, squirrel, bobak, beaver. Feathered animals are the following: duck, coot, pigeon, quail, partridge, pheasant, goose.